Disclosure: This shop has been compensated by Collective Bias, Inc. and its advertiser. All opinions are mine alone. #CraftPBJCreations #Meijer #CollectiveBias. This post is sponsored by The J.M. Smucker Company. Now that the holidays and winter break are behind us, it's time to get back into normal school day routines. I admit, my daughter is less than thrilled about waking early, cracking open the books, and homework, but she is looking forward to socializing with her friends, club activities, and lunch. Lunch is probably her favorite part of the day, and since she packs her school lunch most days instead of purchasing it at school, I thought we'd give her lunchbox a little refresh. A new year calls for a little lunchbox revamp, right? I ran to Meijer and picked up a brand new lunch bag/bento box combination, then grabbed a few lunchbox essentials from the grocery department. You can never go wrong with a good old fashioned pb&j sandwich, so it's a no-brainer for us to reach for Jif® Peanut Butter and Smucker's® Fruit Spread. Both have been long standing family favorites, and it's not hard to see why. 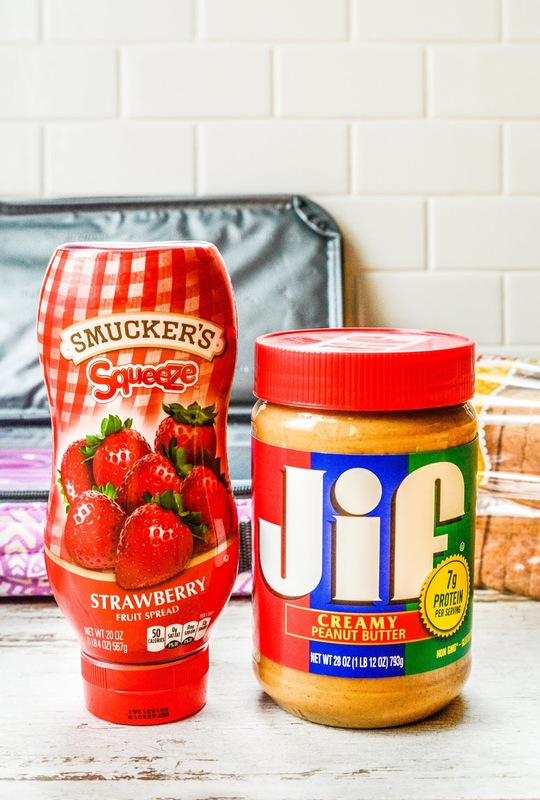 Jif® is the #1 brand of peanut butter in the US* and Smucker's® Fruit Spread is so tasty because of their use of high quality, hand-picked strawberries. When you put them together, you get a great taste and perfect pair. They're just better together! 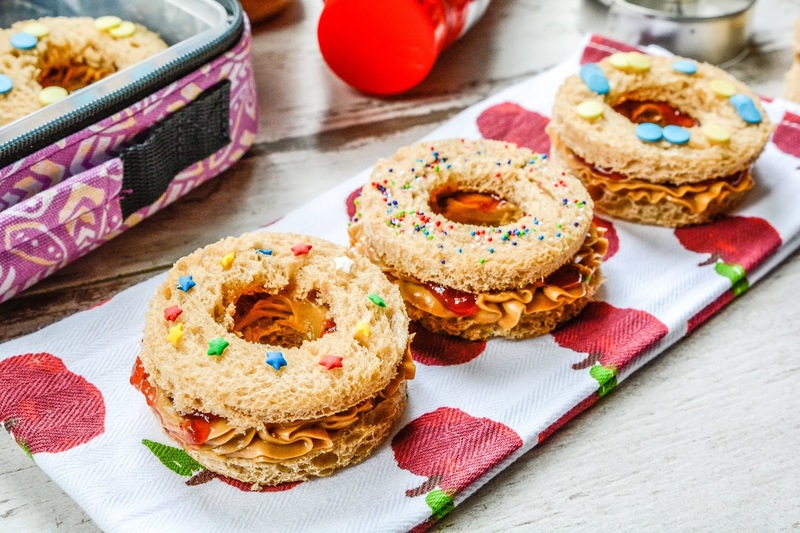 I mentioned giving my daughter's lunchbox a little refresh for the new year, and instead of just slapping a few pieces of bread together and calling it a day, I thought I'd put a little twist on the classic pb&j sandwich and make pb&j "doughnuts" instead. My daughter has never been a fan of the of bread crust, so instead of just chopping it off and leaving the bread as plain squares, we used a doughnut cutter to cut the bread into "doughnuts". I spread some Jif® Peanut Butter and Smucker's® Fruit Spread on the bottom piece of bread, placed the top bread slice over the filling, then pressed some candy sprinkles into the bread grooves to decorate it like a doughnut. I didn't let the centers go to waste either. I constructed them the same as above, but rolled the exposed filling sides in sprinkles instead of trying to fit them on top. It was a fun way to put a new spin on an old classic. 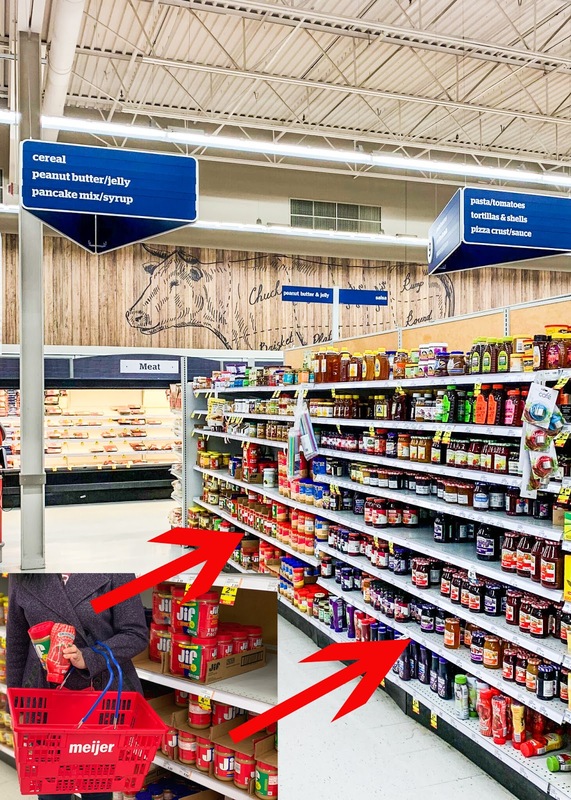 As I mentioned, both Jif® Peanut Butter and Smucker's® Fruit Spread were purchased at Meijer. I found them in the breakfast aisle across from the pancake mixes and cereal. 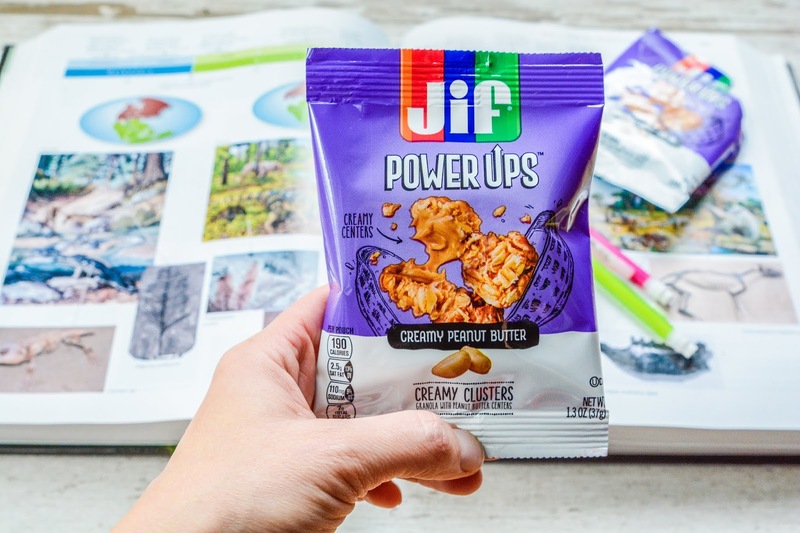 While picking up a few other lunchbox staples, I came across these Jif Power Ups® Snacks. I grabbed a few boxes as well because not only would they be great to tuck into the lunch bag, the portability factor made me think these would be great for my daughter to also keep in her backpack for after school snacking. Her after school activities usually have her getting home close to dinnertime, so I feel better knowing she has a yummy snack to help her power through her activities until she's able to come home for supper. It's the perfect snack to keep her motivated to do her homework as well. 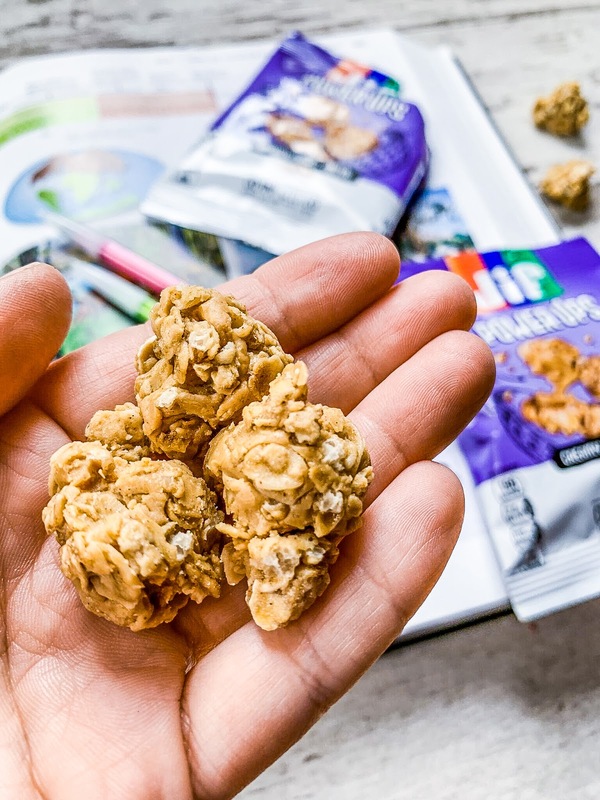 Jif Power Ups® Snacks come in 2 forms: Chewy Granola Bars or Creamy Clusters with peanuts being the #1 ingredient. Since they are made with Jif® Peanut Butter, goodness my family knows and loves, and contain no corn syrup, I feel good serving them to my daughter and she's more than happy to receive them. 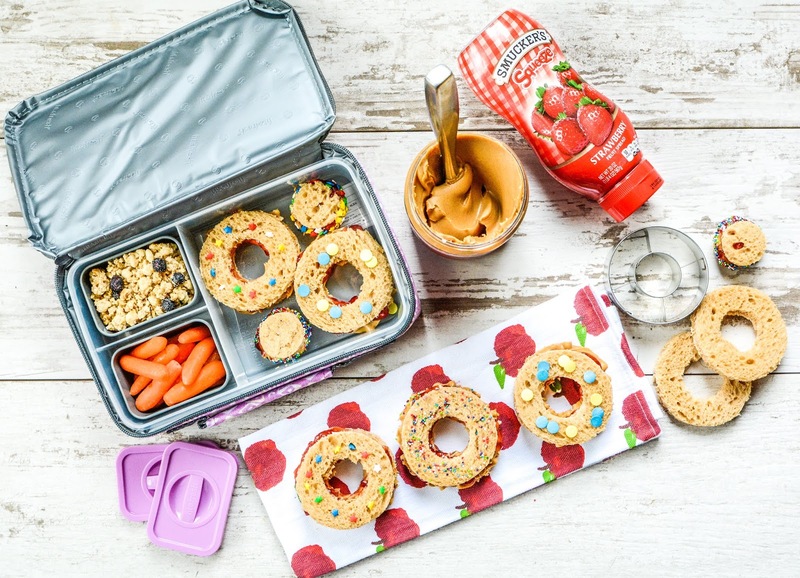 These fun little PB&J doughnuts and Jif Power Ups® Snacks are a great way to get kids excited about going back to school after the long winter break. And, parents will be happy to know that from now until 2/2/19, you can save over $2 on Jif® Peanut Butter, Smucker's® Fruit Spreads, and Jif Power Ups® Snacks with mPerks digital coupons! Hop on over to your local Meijer for these great lunchbox staples and create a fun twist to an old classic for your kid's lunch boxes too! If you would like to learn more about Jif® and Smucker's® products, be sure to check them out HERE. 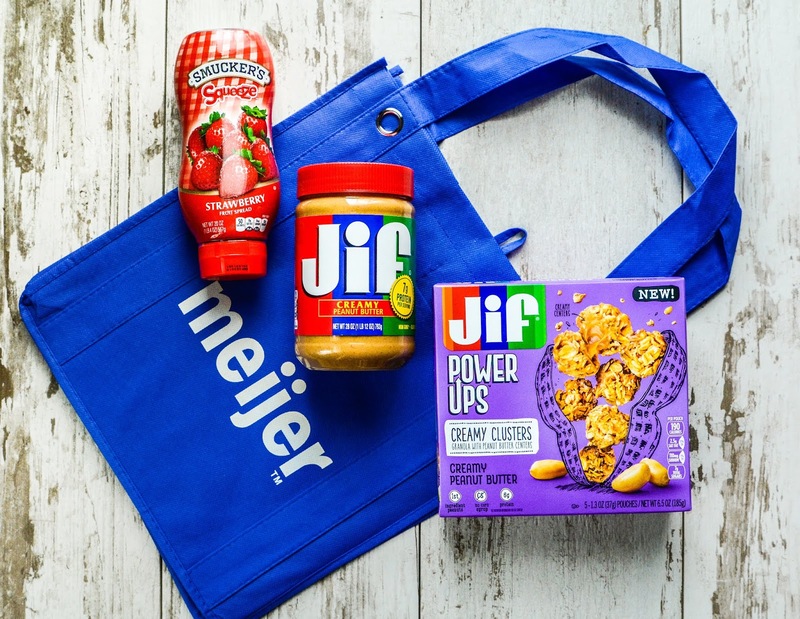 How would you use Jif® Peanut Butter and Smucker's® Fruit Spreads to give your kid's a lunchbox makeover? You did such a lovely photo, especially with that apple kitchen cloth! The strawberry spread has such a lovely packaging, is it the same as normal jam? Yes, it's like jam but it doesn't have seeds. It's easier to squeeze out of the tub too, instead of using a butter knife to scoop it out. An easy snack is a win. Crust was always blah, the donut shape sure fixes that. The cutter does come in handy. Every parent should have one in their stash! That is such a cute idea. What a great way to make food fun. I have to get some cutters. Yes, girl. Get you a cutter. They are great for more than traditional doughnuts. That is so cute! I can't wait to tell my kids they're having donuts for lunch tomorrow. What a cute idea! My kids would be all over these if they had the chance!! Those are a great after school snack! My kids love peanut butter and jelly! 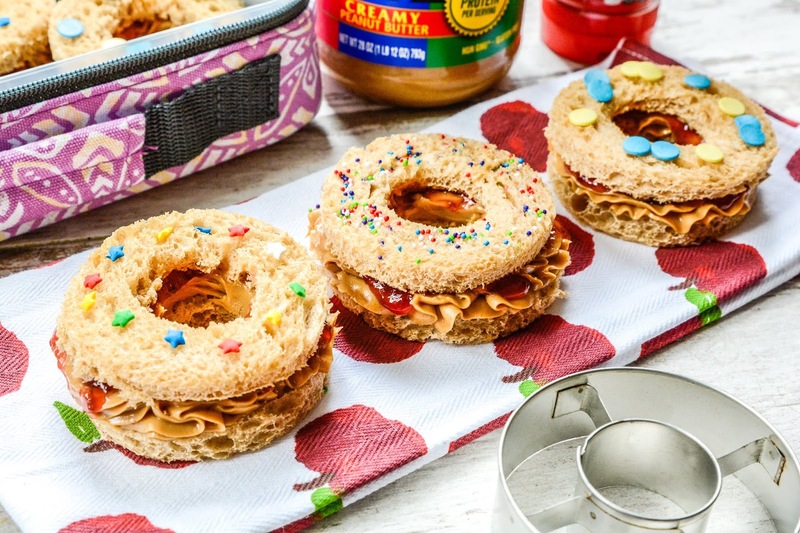 PB&J Donuts sound like an awesome snack idea for my kids. We buy peanut butter in mass quantities around here! I had never heard of those Jif power ups but they sure do seem tasty! And I think my kiddo would totally love them. I love how you turned the sandwiches into pb&j doughnuts. So creative and they look delicious. My nephew would love this idea! This is a really fun way to serve PB&J sandwiches. I will try making this for my grandson. He's turning to be a picky eater. I'd make protein bites. They really like them for breakfast, and would enjoy them in their lunch too.